Dictation Equipment Company first opened it’s doors in 1968 and we still believe in good business traditions. We specialize in digital equipment for dictation and transcription solutions for medical practices, law firms, court reporters, courtroom recording, depositions, meetings and just about any situation that requires an audio recording. Digital equipment includes digital portables , transcription software, speech recognition software and central dictation servers. So give us a call or send us an email. Philips SpeechLive is your personal assistant in the cloud. 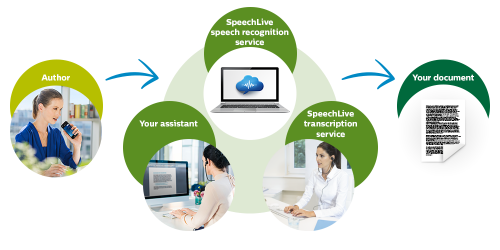 SpeechLive lets you upload, play and download dictation files; and send them to your transcriptionist immediately through the cloud. Simply speak, send and you are done! Files can be recorded on the Philips iPhone or Android dictation app or any Philips digital recorder. All purchases or trials will go thru local dealers so you will have a dealer in your area to assist with setup and training. Digital portable recorders are the most reliable, efficient and easiest way to integrate dictation into office systems. Digital transcription packages that combine foot pedal and headset are the most efficient way to transcribe audio files and integrate them into office workflow. Microphones that allow user control and dictate directly into a computer.Great for Voice Recognition users. Users can create crystal-clear voice recordings anywhere with their smartphone. The ultimate in convenience. Our selection of used and refurbed equipment. Includes digital recorders and older cassette machines. Essential accessories needed for transcription of digital and analog files. Connect these devices to a phone line and have authors call-in and dictate. Files download to a computer for transcription. Central system takes dictation from telephone, portable recorders, mic on a PC or a dictation app from a smartphone. A whiteboard that lets you project PC screen images onto it, and lets you operate the PC right from the board surface. This contributes to smooth, easy-to-understand presentations and is ideal for meetings in which Websites are displayed, motion images are shown, and additional information is written while meeting. The newest product on the market, the Philips SpeechAir recorder connects to your network wirelessly to upload files the instant they are finished and ready for transcription.